The Wollemi National Park is a protected national park and wilderness area that is located in the northern Blue Mountains and Lower Hunter regions of New South Wales, in eastern Australia. The 501,703-hectare (1,239,740-acre) park, the second largest national park in New South Wales, contains the 361,113-hectare (892,330-acre) Wollemi Wilderness – the largest such wilderness area in Australia – and is situated approximately 130 kilometres (81 mi) northwest of Sydney. The Wollemi National Park is one of the eight protected areas that, in 2000, was inscribed to form part of the UNESCO World Heritage–listed Greater Blue Mountains Area. The Wollemi National Park is the most north–westerly of the eight protected areas within the World Heritage Site. The national park forms part of the Great Dividing Range. It contains the only known living wild specimens of the Wollemi Pine (Wollemia nobilis), a species thought to have become extinct on the mainland approximately thirty million years ago, but discovered alive in three small stands in 1994. 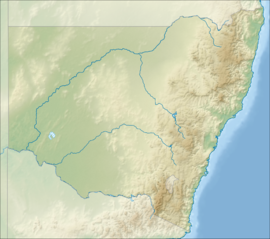 The national park is bounded to the north by the Goulburn River National Park and the Bylong Valley Way; to the east by the Yengo National Park, the Parr State Conservation Area, and the Putty Road; to the south by the Blue Mountains National Park and the Bells Line of Road; to the south–west by the Wolgan Valley and the Gardens of Stone National Park; and to the west by open farmland that surround the towns of Rylstone and Kandos and the Capertee Valley. The Wollemi National Park is located on the western edge of the Sydney Basin. It sits on four strata of sedimentary rock; the Narrabeen and Hawkesbury sandstone and shale, the Illawarra and Singleton Permian coal measures and the Wianamatta shales. The strata at this area of the Sydney Basin have an upwards tilt to the north-west. Throughout most of the park the Hawkesbury and Wianamatta series have been eroded away exposing the Narrabeen group. The landscape of the park is dominated by deep valleys, canyons, cliffs and waterfalls, formed by the weathering of the sandstone and claystone the Narrabeen group consists of. The parts of the park that lie on the Narrabeen and Hawkesbury sandstones generally have shallow soil with low nutrient levels while areas that lie on the Wianamatta shale usually have deeper and more nutrient rich soils allowing for a greater diversity of plant life. The coal measures are visible beneath cliff lines along river valleys. This layer is generally rich in nutrients and weathers to form deep clay loams. Tertiary basalt is common in the north west of the park. Basaltic peaks include Mount Coriaday, Mount Monundilla and Mount Coricudgy, the highest peak in the northern Blue Mountains. In some locations the basalt in the core of extinct volcanoes has eroded faster than the surrounding sandstone. The Wollemi National Park is key in maintaining the quality of many tributary rivers to the Hawkesbury River and Goulburn-Hunter River catchments. The national park incorporates rivers such as the Wolgan River, Colo River and Capertee River which arise from outside the park. The Colo River is regarded as the last unpolluted river in New South Wales because the majority of it flows through the Wollemi National Park. Eucalypt dominated open forests comprise 90% of Wollemi National Park, with over 70 species of Eucalypt recorded. The remaining 10% of the National Park comprises rainforest, heath and grassland. The variety of habitats within Wollemi National Park allow for large diversity in animals. 58 reptile species, 38 frog species, 235 bird species and 46 mammal species have been recorded in the park. As well as the Wollemi Pine and Wollemi Mint Bush, the park contains populations of the rare Banksia conferta subsp. penicillata, only described in 1981. The Wollemi Stringybark is a recently discovered new species of Eucalyptus tree. Aerial perspective of the Grey Gum International Cafe, nestled between Wollemi and Yengo national parks on an autumn morning. February 2018. There are many aboriginal sites within the park including cave paintings, axe grinding grooves and rock carvings. In 2003 the discovery of Eagle's Reach cave was publicly announced. This site was found by bushwalkers in 1995 but remained unknown to the wider community until a team from the Australian Museum reached the cave in May 2003. The art within this small cave is estimated to be up to 4,000 years old and it consists of up to a dozen layers of imagery depicting a wide variety of motifs rendered in ochre and charcoal. The team who recorded this site counted over 200 separate images, mainly of animals and birds but also stencils of hands, axes and a boomerang. It is a very significant site and the remote location is being kept secret for its own protection. Ganguddy Campground is a campsite located on the Cudgegong River in the park. The local Wiradjuri Aboriginal people know the area as Ganguddy, the alternative name is Dunns Swamp. National Parks and Wildlife Service,New South Wales manages the location. ^ a b "Wollemi National Park: Park management". Office of Environment & Heritage. Government of New South Wales. Retrieved 3 October 2014. ^ "Greater Blue Mountains World Heritage Area: Strategic Plan" (PDF). NSW National Parks and Wildlife Service (PDF). Government of New South Wales. January 2009. p. 15. ISBN 978-1-74122-960-8. Retrieved 3 October 2014. ^ "Greater Blue Mountains Area". World Heritage List. UNESCO. 2014. Retrieved 31 August 2014. ^ Mattila, Samantha (2003). "Ancient World of Wollemi Pine Reveals New Treasure". Retrieved 26 July 2006. ^ "Wollemi National Park". Office of Environment & Heritage. Government of New South Wales. Retrieved 3 October 2014. ^ "Wollemi National Park: Landscape and Geology". Office of Environment & Heritage. Government of New South Wales. Retrieved 3 October 2014. ^ a b "Wollemi National Park: Native vegetation". Office of Environment & Heritage. Government of New South Wales. Retrieved 3 October 2014. ^ "Wollemi National Park: Native animals". Office of Environment & Heritage. Government of New South Wales. Retrieved 3 October 2014. ^ "Wollemi National Park: Aboriginal heritage". Office of Environment & Heritage. Government of New South Wales. Retrieved 3 October 2014. ^ "Dunns swamp - Ganguddy campground | NSW National Parks". NSW National Parks. "Wollemi National Park". NSW National Parks and Wildlife Service. Government of New South Wales. "Wollemi National Park". Office of Environment & Heritage. Government of New South Wales. "Greater Blue Mountains World Heritage Area: Strategic Plan" (PDF). NSW National Parks and Wildlife Service (PDF). Government of New South Wales. January 2009. ISBN 978-1-74122-960-8. This page was last edited on 19 February 2019, at 10:47 (UTC).